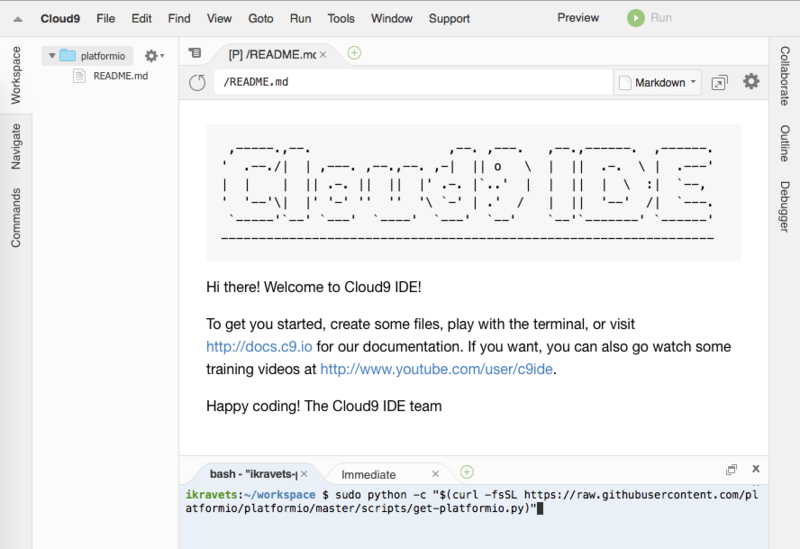 Cloud9 combines a powerful online code editor with a full Ubuntu workspace in the cloud. 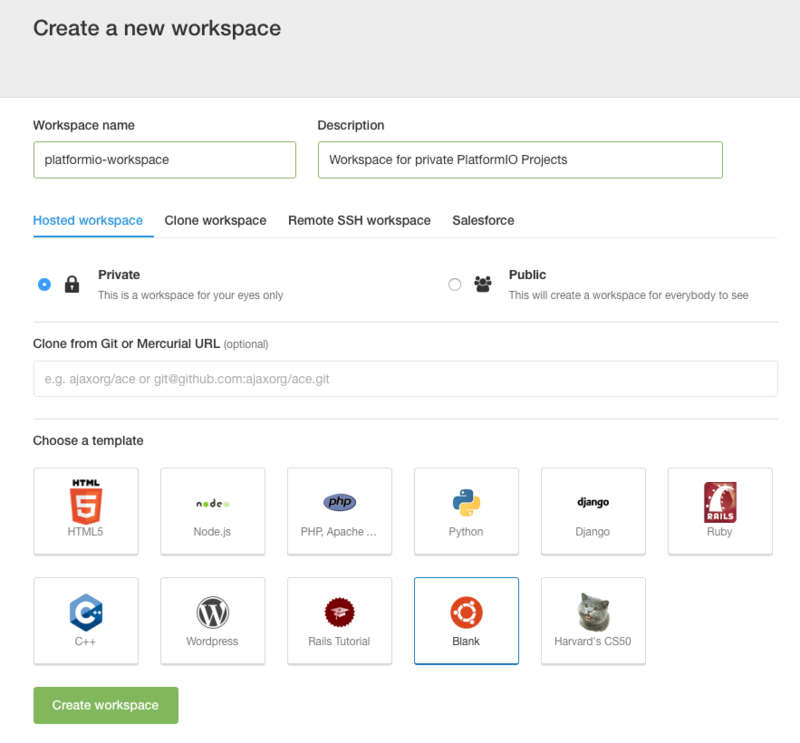 Workspaces are powered by Docker Ubuntu containers that give you full freedom over your environment, including sudo rights. 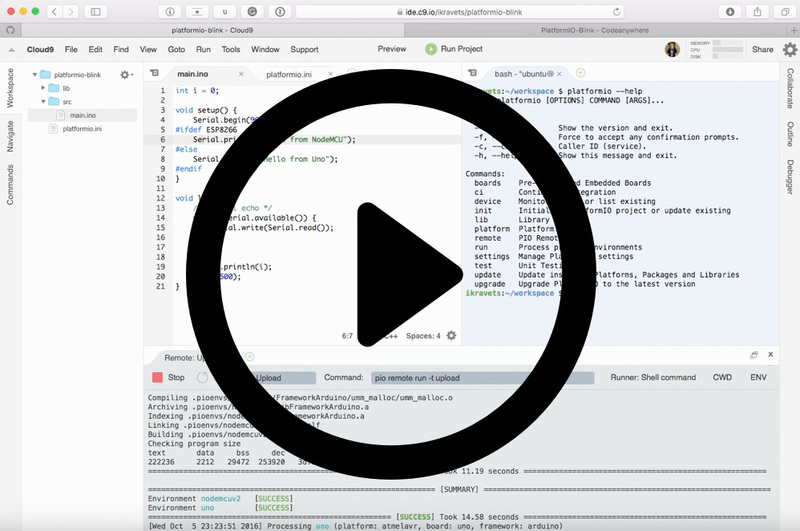 Do a git push, compile SASS, see server output, and Run apps easily with the built-in Terminal and Runners. Sign in to Cloud9. A registration is FREE and gives you for FREE 1 private workspace (where you can host multiple PlatformIO Projects) and unlimited public workspaces. sudo python -c "$(curl -fsSL https://raw.githubusercontent.com/platformio/platformio/develop/scripts/get-platformio.py)"
Log in to PIO Account using platformio account login command. 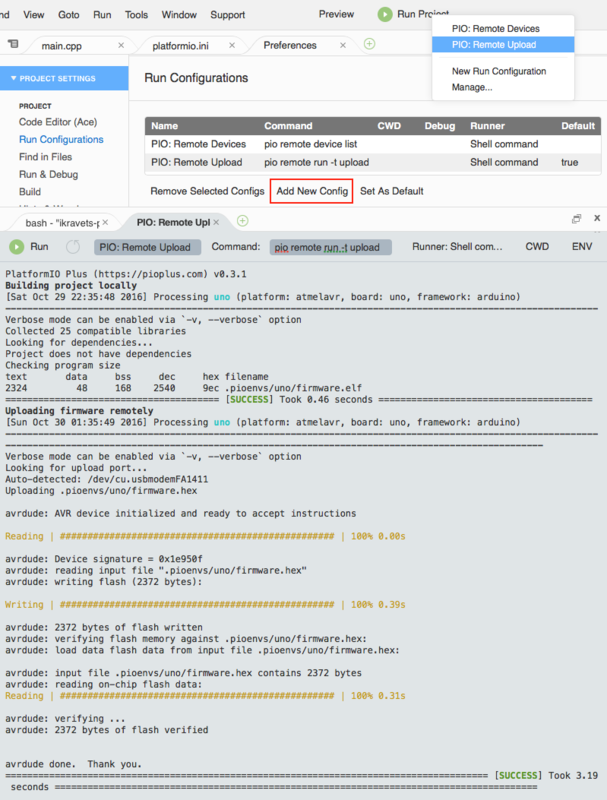 To get board ID please use platformio boards command or Embedded Boards Explorer. 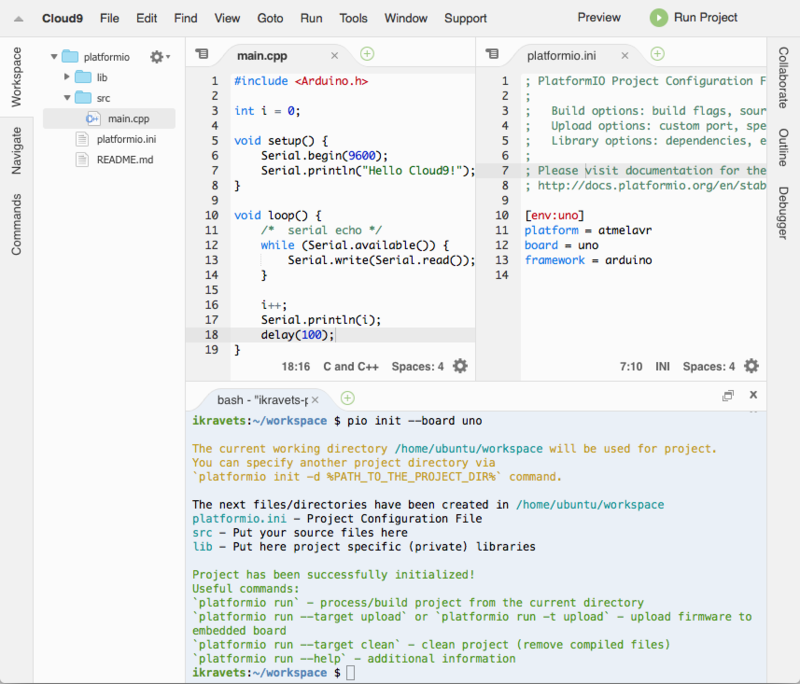 If you are interested in better integration with Cloud9 and GUI, please read guide below where we will explain how to create custom Build System for PlatformIO and own Runners. Cloud9 allows one to create own build system and use hotkey or command (Menu: Run > Build) to build a project. Save new Build System and give a name PIOBuilder. Now, you can select it as default Build System using Menu: Run > Build System > PIOBuilder. Remote Device Manager works in pair with PIO Remote. You can list remote devices that are connected to host machine where PIO Remote Agent is started or are visible for it. 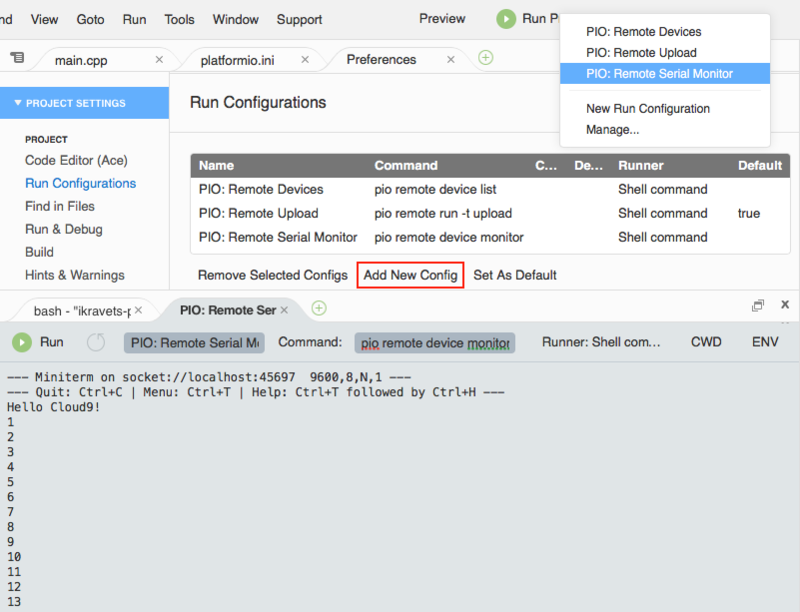 Remote Firmware Uploading works in pair with PIO Remote. 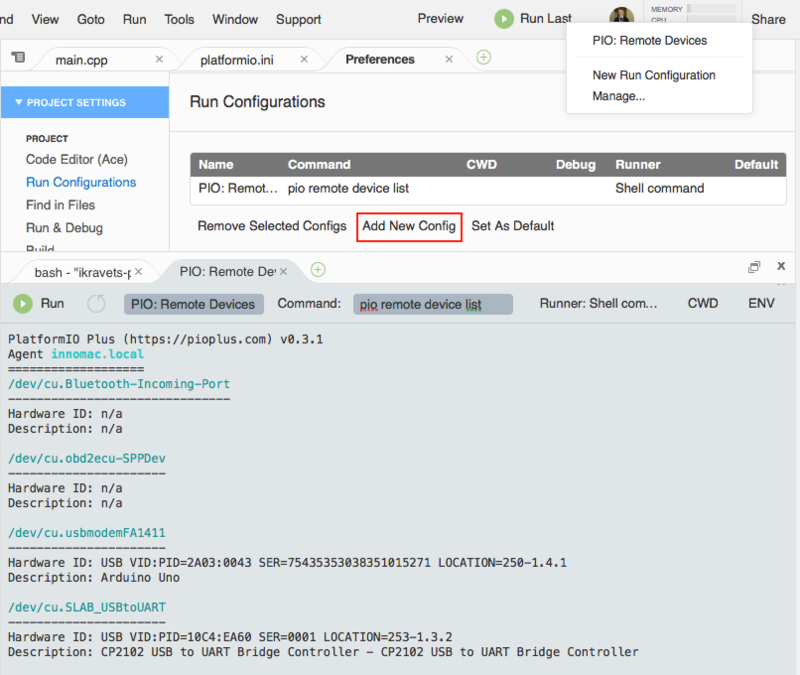 You can deploy firmware (program) to any devices which are visible for PIO Remote Agent. Remote Serial Port Monitor works in pair with PIO Remote. You can read or send data to any device that is connected to host machine where PIO Remote Agent is started. To list active agents please use this command platformio remote agent list.